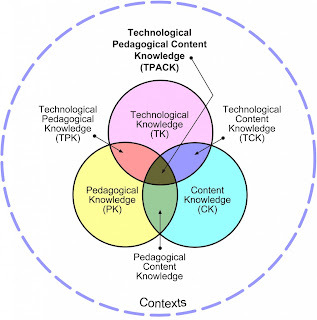 Another great session I was able to participate in at RSCON3 was the transformative technology debate about what technologies best support education transformation with Tom Whitby, Steven Anderson, Joquetta Johnson and Naomi Harm. The debate was about what kind of learning we want, what kind of environment we want and how technology can make this more powerful. Because technology is changing so quickly it's not possible to say what will be around in the future, but it seems clear there will be a shift towards blended and online learning environments rather than just face-to-face teaching. Steven Anderson made the point: Good teachers teaching good content is going to save education. 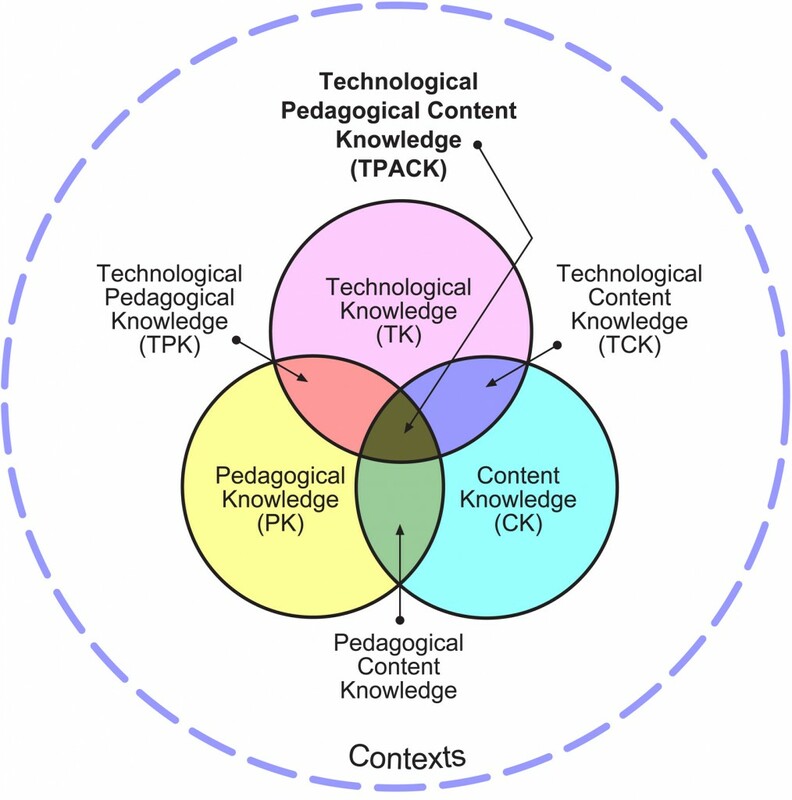 He provided a link to TPACK (Technical Pedagogical Content Knowledge required by teachers for technology integration in their teaching). Tom Whitby talked about how social media will begin to change things. Currently only a small percentage of educators use social media today, yet collaboration, communication and critical thinking are important skills for lifelong learning. Today's lifelong learners are those who are on social media and who are continuing to learn. Obviously everyone participating in RSCON was comfortable with social media - Tom asked: What makes us different? Why do we use social media? Joquetta Johnson attempted to answer this. She said many teachers say they don't have enough time to explore how social media can transform their teaching - we make time for it because we are passionate about it. She said we need to have some non-negotiables and educators need to be held accountable if they are not using these tools. Time cannot be an excuse - but schools and teachers need to prioritize what they do with the time available. Another difference between teachers using social media and those not using it is that we are risk-takers. We can see the changes that it makes when we use technology with our students. She suggested pairing up those educators who were reluctant to take risks with someone else globally online. 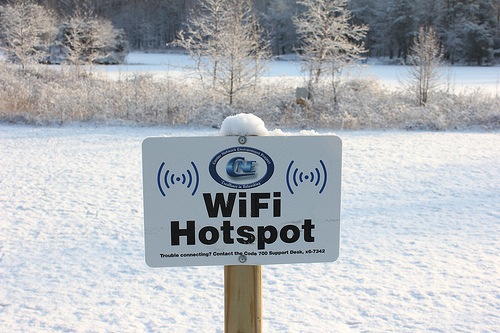 Cost is definitely not an issue - most Web 2.0 tools are free. We have to be the ambassadors for teacher learning as well as student learning. In today's world teachers are no longer the experts - our roles are changing to facilitators and moderators of learning. We cannot keep up with the way content is changing, but in fact we no longer have to deliver content: we have to guide the students to find it. There were discussions about how school leaders need to be more involved with their faculties: too many administrators are trying to lead from their offices. Professional development is often not meeting teachers' needs. Tom Whitby pointed out that social media is a literacy and that when it comes to literacy many of our educators are illiterate and this must change in order for education to move forwards. 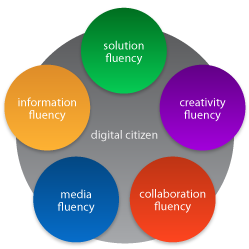 A link was shared to the 21st century fluency project. The unconference and edcamp models are the ways PD should be moving. Finally it was discussed that we perhaps shouldn't be referring to "social" media - perhaps instead we should be calling it "learning" media.